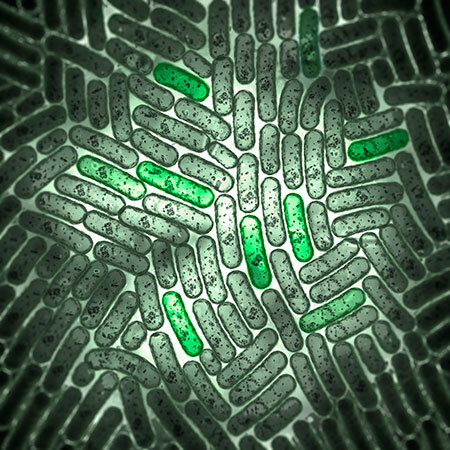 (BOSTON) — Synthetic biologists are learning to turn microbes and unicellular organisms into highly productive factories by re-engineering their metabolism to produce valued commodities such as fine chemicals, therapeutics and biofuels. To speed up identification of the most efficient producers, researchers at Harvards Wyss Institute for Biologically Inspired Engineering describe new approaches to this process and demonstrate how genetically encoded fluorescent biosensors can enable the generation and testing of billions of individual variants of a metabolic pathway in record time. The discussion and findings are reported in Trends in Biotechnology and the Proceedings of the National Academy of Sciences (PNAS). 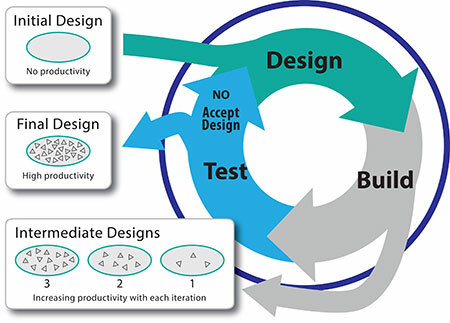 Biotechnologists that tinker with the metabolism of microorganisms to produce valued products look at the engineering process through the lens of the so-called ‘design-build-test cycle.’ The idea is that multiple iterations of this cycle ultimately allow the identification of combinations of genetic and metabolic elements that produce the highest levels of a desired drug or chemical. Key to the cycles efficiency, however, is the ability to construct and test the largest number of variants possible; in the end, only a few of these variants will produce the product in industrially attractive amounts. In the Trends in Biotechnology article, Wyss Institute scientists George Church, Ph.D., and Jameson Rogers, Ph.D., lay out the current state-of-the-art for designing, building and testing many variants at a time, a methodology that bioengineers call ‘multiplexing’. Church is a Wyss Institute Core Faculty member and Professor of Genetics at Harvard Medical School and Rogers, currently with the Boston Consulting Group, performed his work as a Harvard Pierce Fellow and Doctoral Student mentored by Church. “The real bottleneck in achieving high-throughput engineering cycles lies in the testing step. Current technology limits the number of designs scientists can evaluate to hundreds, or maybe even a thousand, different designs per day. Often the assays necessary are painstaking and prone to user error,” said Rogers. “Now, by having developed both types of genetically encoded biosensors we can close the loop of a fully multiplexed engineering cycle. This enables exploration of design spaces for specific metabolic pathways in much greater breadth and depth. Fluorescent biosensors, in particular, enable a brand new type of pipeline engineering in which we can observe metabolic product levels at all times during the process with extraordinary sensitivity and ability to further manipulate the engineering cycle,” said Church. Earlier work by Churchs team at the Wyss Institute already demonstrated that the levels of commercially valuable chemicals produced by bacteria could be raised through several rounds of a design-build-test cycle that employed an antibiotic selection-based biosensor. Now, Church and Rogers report in PNAS the unique advantages that fluorescent biosensors provide to bioengineers. “Our fluorescent biosensors are built around specialized proteins that directly sense commercially valuable metabolites. These sensor proteins switch on the expression of a fluorescent reporter protein, resulting in cellular brightness that is proportional to the amount of chemical produced within the engineered cells. We can literally watch the biological production of valuable chemicals in real-time as the synthesis occurs and isolate the highest producers out of cultures with billions of candidates,” said Rogers, who was named one of Forbes’ “30 Under 30” in Science for opening new perspectives in bioengineering. “This newly emerging biosensor technology has the potential to transform metabolic engineering in areas ranging from industrial manufacturing to medicine, and it can have a positive impact on our environment by making the production of drugs and chemicals independent from fossil fuels,” said Wyss Institute Founding Director Donald Ingber, M.D., Ph.D., who is the Judah Folkman Professor of Vascular Biology at HMS and the Vascular Biology Program at Boston Childrens Hospital, as well as Professor of Bioengineering at the Harvard John A. Paulson School of Engineering and Applied Sciences.